The NCJLA provides league structure to over 50 clubs, which in turn support lacrosse for approximately 10,000 players, coaches and administrators. And these numbers are growing. With so many participants and so few NCJLA staff, it is important to follow the lines of communication when raising an issue or seeking clarification. Parents and players should first work with their coach. A coach can then contact the club’s NCJLA representative, who should be familiar with the NCJLA’s policies. Parents and coaches are encouraged to refer to the Operations Guide before contacting someone with an issue. 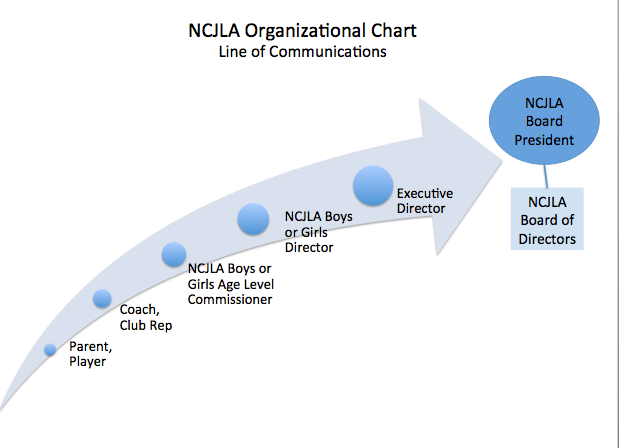 If something is not clear or an issue remains unresolved, the club representative or the coach can contact the appropriate NCJLA’s age-level commissioner for clarification or to discuss an issue. If necessary, the commissioner can then take the issue to the NCJLA girls or boys director, who will resolve the matter or, if necessary, take it to the executive director, and possibly the board. It is the goal of the NCJLA to provide as much information as possible in this guide and on our website to resolve issues in a timely and efficient manner.